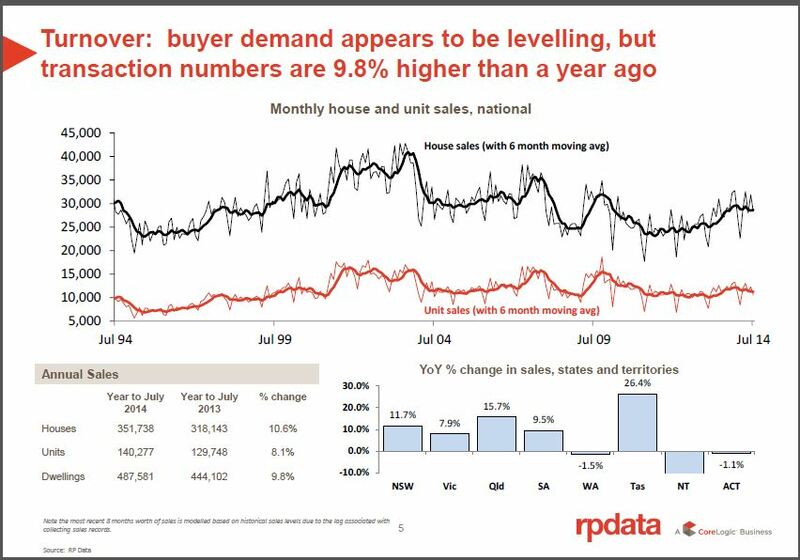 RPData have released their stats for our housing markets up until the end of September 2014. 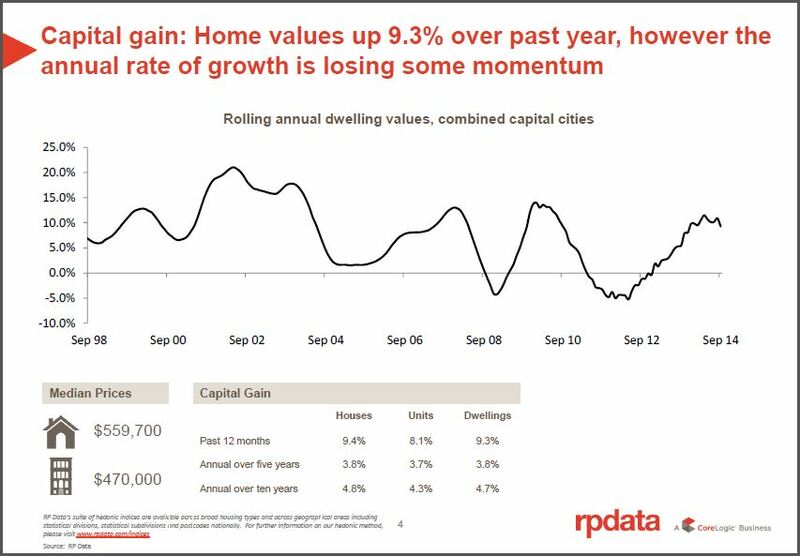 Home values increased by 0.1% across the combined capital cities in September and rose by 2.9% over the three months to September 2014. Over the month, home values fell in all capital cities except for Sydney, Brisbane and Adelaide. Over the past three months, values increased in every city except for Perth and Hobart. Capital city home values rose in each capital city over the past year, the greatest increases were recorded in Sydney (14.3%), Melbourne (8.1%), Darwin (7.1%) and Brisbane (6.4%) with all other capital cities recording value growth of less than 6.0%. The annual rate of value growth across the combined capital cities has slowed from a peak of 11.5% in April 2014 to 9.3% over the past 12 months. Over the 12 months to July 2014 there were 351,738 houses and 140,277 units sold across the country. House sales are 10.6% higher over the year compared to an 8.1% rise in unit sales. 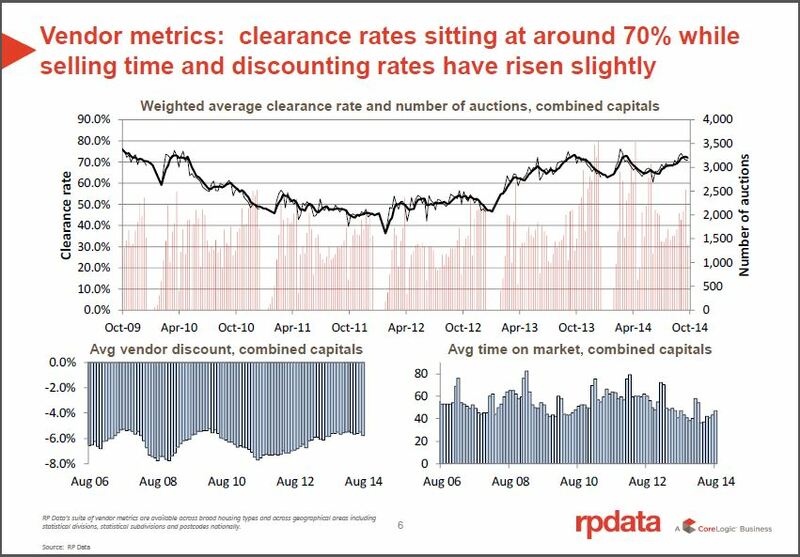 Auction clearance rates are consistently around 70% each week across the combined capital cities. Discounting levels and days on market are low although they have increased slightly over recent months. The median weekly rent across the combined capital cities is recorded at $481 and rents have increased by 2.1% over the past year. 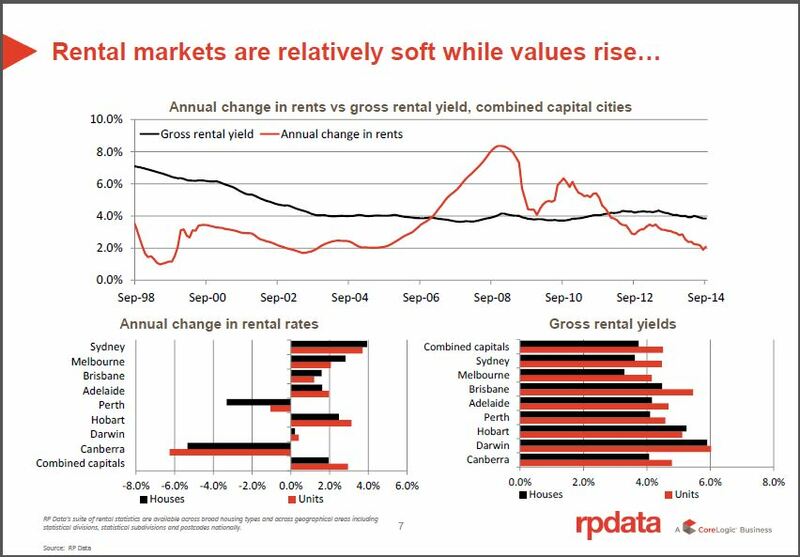 Gross rental yields are recorded at 3.8% across the combined capital cities, down from 4.1% a year ago. 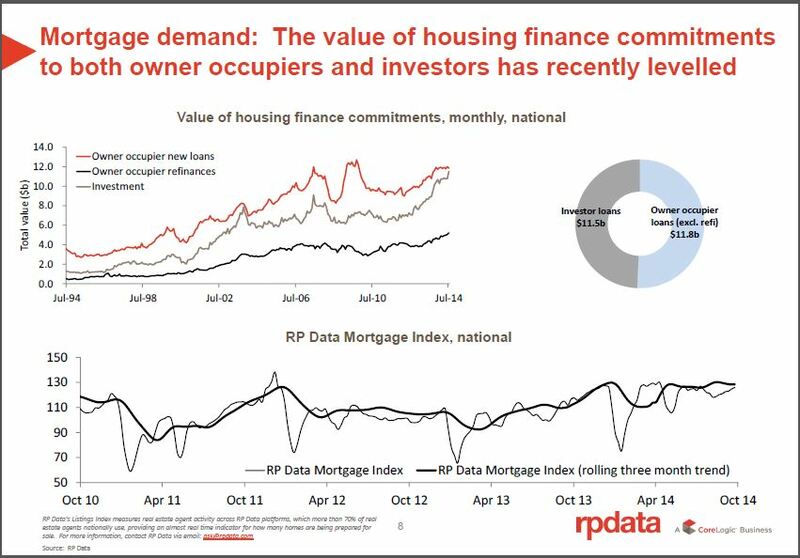 The RP Data Mortgage Index (RMI) shows that mortgage demand has begun to level over the past couple of months. ABS housing finance data shows a similar trend with the market largely driven by upgraders and investors. 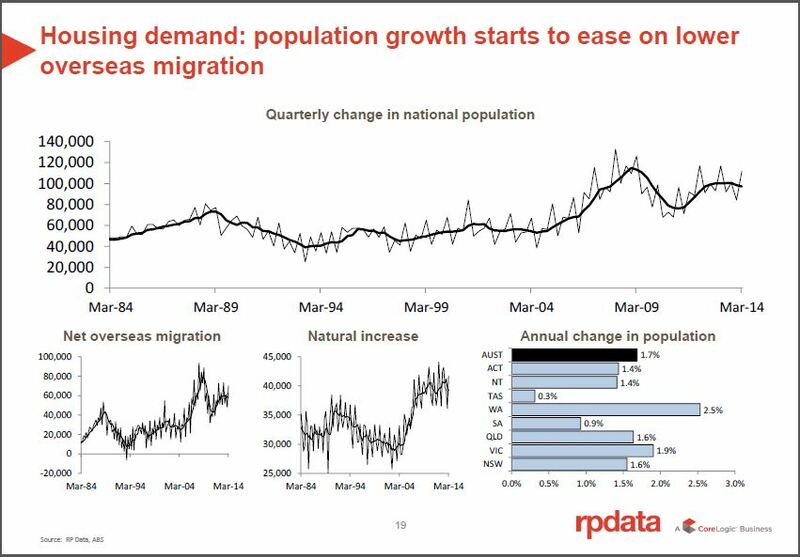 Population growth is winding down but remains high on an historic basis. Dwelling approvals have shifted much higher over the past year and are at their highest ever level on an annual basis. With population growth slowing and building approvals remaining high (despite the recent fall) we may see a better relationship between approvals and population growth over the coming years. Consumer sentiment has been weak since the Federal Budget and fell again in September. The unemployment rate has reduced to 6.1% over the month and despite the monthly falls it sits at its highest level in more than a decade. Mortgage rates remain low with banks competing hard for their share of the home loan business.